The prevailing view of customer support is that it’s a cost center, and that companies are always looking to lower those costs. The problem with this train of thought: you’re missing out on revenue. At Intercom, we have learned that investing in real-time customer support, with response times under 5 minutes, can actually turn customer support into a revenue driver. We provided real-time support to a test group of new customers during their first 45 days after signing up, and it helped drive 15% incremental growth in new business revenue. Drive operational efficiency – e.g. improve team productivity, offer self-service support. This is a worthy goal for every support organization, including ours. Dilute customer experience – e.g. make it harder to reach support or increase response times. We believe that this approach is counterproductive to a businesses’ revenue objectives. Your customers’ expectations are likely very similar. Look no further than the 2017 edition of Mary Meeker’s Internet Trends Report. A survey cited there found that when respondents were asked to name two ways organizations could improve their customer service, the most common responses were easier access to online channels and faster agent response times. In the summer of last year, we reflected on how our support team was meeting our customers’ expectations. Our customers could easily reach support through our messenger from anywhere on our marketing site and from inside our app. A ~95% CSAT score reflected the exceptional quality of support our team was delivering day in and day out, and our customers were also largely happy with our median response time of an hour. However, we wondered what impact offering real-time support would have on our business and our customers. We specifically wanted to focus on the sign-up, trial and onboarding stages of our new customers’ journey, when they needed support the most. We hypothesized that once new customers realize support is available at a moment’s notice, they will reach out with more questions. Since questions from new customers are typically around product-fit (e.g. can I do X with your product?) or path-to-value (e.g. how do I set up? 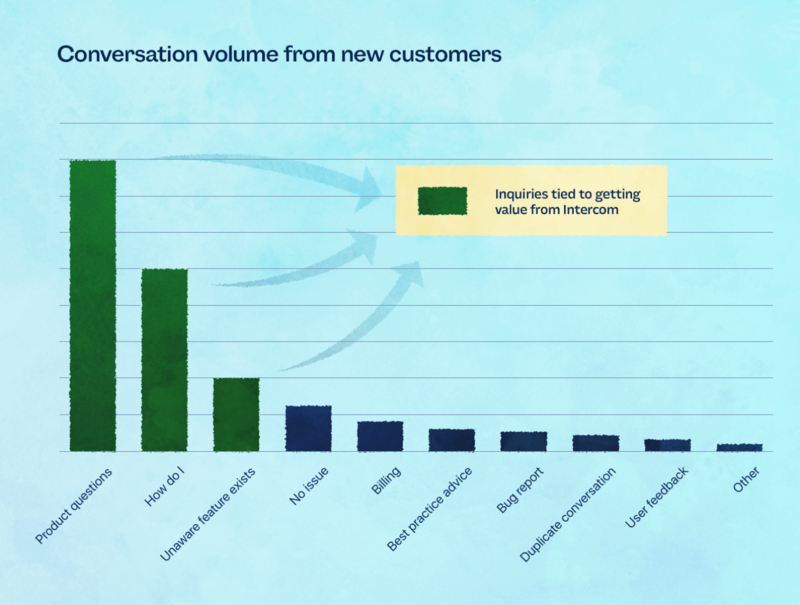 ), a real-time support conversation increases the odds of them understanding the value of Intercom. As a result more customers will start trials, activate the products and find success from using Intercom to communicate with their customers. This in turn will improve our conversion and retention rates, thus driving growth in our business. To test this hypothesis and measure the impact on our business, we ran a 16-week randomized split test. Roughly 1 in 2 new sign-ups were tagged as the test group and were eligible to receive real-time support; however, we did not proactively advertise real-time support to them. When customers from the test group started a conversation through the Intercom messenger, they were routed to a dedicated, real-time inbox. The reps staffing this real-time inbox targeted a median first response time of 2 minutes and subsequent response in real-time. Most questions from new customers are typically around product-fit or path-to-value. Customers in the test group stopped receiving real-time support after the purchase and onboarding stage. Meanwhile, conversations from customers in the control were supported with a response time of an hour. For both groups, our support reps just focused on doing what they know best – helping answer the customer’s questions. They did not indulge in any sales type activities (e.g. proactively pitching customers to start a trial). Our prevailing view, and what this test came to show, is that you don’t have to give your support team a new charter to make them a revenue driving org. They asked 18% more questions and got more answers in real-time from our support team. They were 30% more likely to start a trial. Overall, real-time support drove 15% incremental growth in new business revenue. These customers were happier too – with a 15% higher NPS score. There’s data suggesting that the higher a customer’s NPS, the higher their lifetime value. As a result of these revenue benefits, we’re now rolling out real-time customer support to all new Intercom customers. Real-time support drove 15% incremental growth in new business revenue. One thing to note: these benefits did not come for free. There were increased operational costs and complexity to consider. 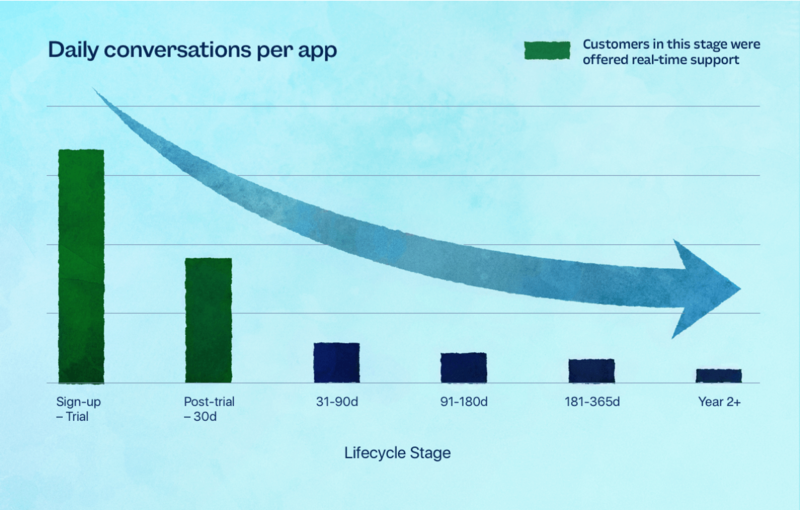 Our real-time inbox was 15-20% more expensive to operate than our normal inbox – costs driven by higher conversation volumes per customer, inherently spikier demand and the fact that we were testing our processes on the fly. These costs can be reduced by creating tailored workflows for real-time support and improving scheduling to better match support capacity to demand on an hourly basis. Thus, your support organization needs to have a certain level of operational maturity to efficiently implement real-time support. Even before perfecting our workflows, the cost increase was more than offset by the increase in new business revenue. This is not entirely surprising. In the real world, we enjoy shopping at businesses where it is easy to find a friendly associate when we have a question. The associate’s personal help makes us more likely to buy and come back again and again. If real-time customer support can make your internet business just as personal, why should the impact on your bottom line be any different? Interested in bringing real-time support to your business? Learn how Intercom can help.